Posted on January 5, 2012 November 21, 2013 by Doug Eisenstark, L.Ac. Headaches can be slightly annoying or absolutely devastating. A dull headache that appears after the period then one can look at Si Wu Tang. If they are milder or appear around the time of the period or with stress, we suggest either Xiao Yao Wan or Jia Wei Xiao Yao Wan. If there is a rage associated with it, bright red tongue or thick coat then take a look at Gentiana Combination (long dan xie gan tang). If your headache is associated with a “muzzy head”, unclear thoughts, heavy head, thick yellow coat then look at Wen Dan Tang and see if it fits your symptoms. appears around the period, especially before. this could appear with a very red tongue and other heat symptoms in urination or rash. Normal pink tongue with thin coating that you can see through. Tongue with red dots toward the sides. Can appear on both sides too. 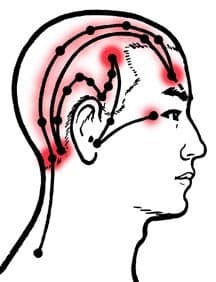 Headaches that appear on one side or two sides, at the temples, or behind the eye(s) all have one causal factor in common. It is the organ that Chinese medicine calls the Liver. To put this into familiar terms, this suggests that the cause is either hormonal in origin (monthly cycle) or stress-induced. As is the case with all organ names at Eagle Herbs, when they’re capitalized, it means that we’re talking about the Chinese medicine version of the organ which is a different animal entirely from the biomedical idea of the “liver”. Please note that there is no point on this page in which the idea of “liver detox” is presented. Chinese medicine is considered a “functional medicine” but the idea of “detoxification” does not apply to the Liver based headaches. For more about the “Chinese Liver” follow this link.